How Does The $4,800 Work? It's simple. You sell $320,000 in real estate at 3% and we split the commission $4,800 to you and $4,800 to the company. After that, you receive 100% of the commission for the rest of your calendar year. 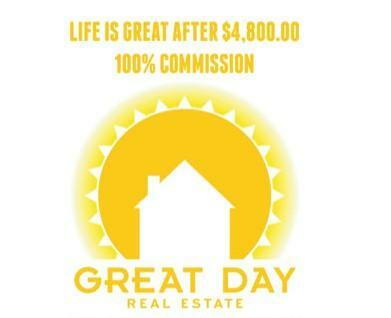 The commissions are split 50/50 until you have paid Great Day Brokers $4,800. This typically only takes 1 - 2 transactions. A lot of automated nurturing occurs via SMS and Email so when your leads are ready to buy or sell, they call YOU, not one of your competitors. Designed to help you grow market share & recruit quality agents, all while automating a lot of the follow up processes that can sometimes fall through the cracks. Learn More and Lets connect! Check out Frequently asked questions ! 1. What if I don't sell any homes? A. If you do not sell any homes the $4,800 is not paid and does not roll over into next year. 2. Do I really receive 100% after the $4,800 is paid annually? 3. Does the fee reset every January or each year on the anniversary? 4. Are there any other ways to pay the $4,800? A. Yes, you can choose to pay $400 per month and start receiving 100% of the commission immediately. 5. Can I switch between the 50/50 option and the month plan? A. Yes, you can switch every year on your anniversary date for the upcoming year to best suit your business. 6. What if I decide to leave? A. We have an Agent Centric Exit Program as well. We only want agents who want to work at Great Day Real Estate. Agents can leave at any time and take their listings with them without a referral fee. If the $4,800 is not paid, they do not have to pay it.